In this review, just out in Tree Physiology, we assess the literature researching how the composition of UV, blue, and red/far-red regions of the spectrum affect bud burst and leaf senescence phenology. The effect of climate change on phenology is a strong determinant of fitness. But shifts in the timing of annual events and the polewards displacement of species ranges both have the potential to interfere with the interactive control of phenology by temperature and photoreceptor-mediate processes. 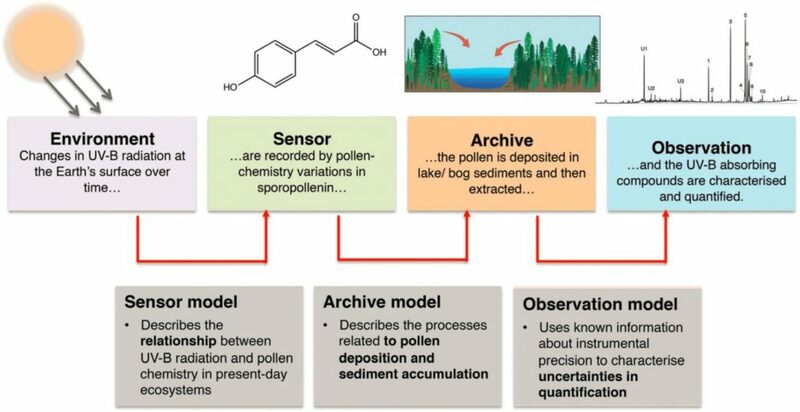 This dictates that to anticipate plant responses to climate changes, we must gain an understanding the mechanisms underlying the role of spectral composition in phenology. 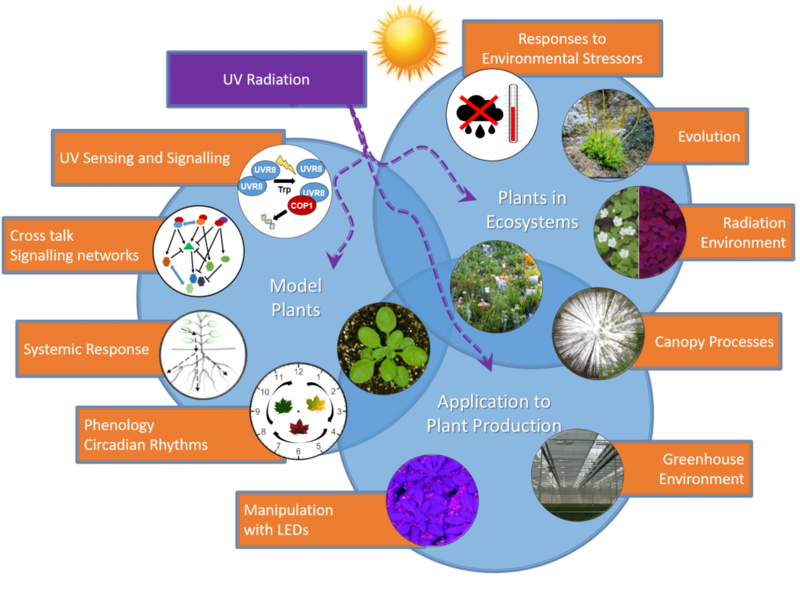 Our new and comprehensive review and perspective on the future of plant-UV research assimilates the knowledge and insight across the breadth of plant science from researchers in UV4Plants Association. We hope that it will inspire researchers in their attempts to better understand plant responses to UV radiation and to put this knowledge to practical use. 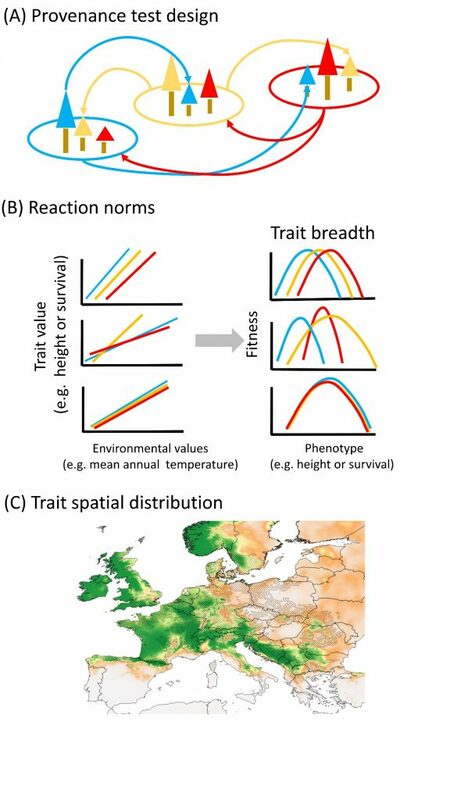 My colleagues Marta Benito Garzón and Arndt Hampe and myself have put together a guide to the utility of new ΔTraitSDM: species distribution models that incorporate phenotypic plasticity. A preview of the paper in New Phytologist is on-line now. How can we track long-term trends in solar UV-B irradiance? Is there potential to apply our knowledge that plant phenolic compounds respond to UV-B radiation to infer past changes in global solar UV-B irradiance? This is the possibility that we explore in a Perspective paper just out in Photobiological & Photochemical Sciences. Our collaborators from the University of Bergen in Norway and University of Innsbruck intend to test the potential for us to use fossilised pollen grains to do just that. 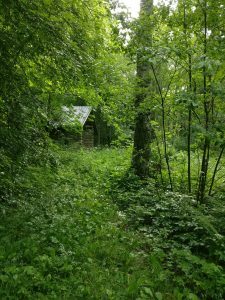 By testing whether the UV-screening phenolics in the pollen of trees growing today tracks their exposure to UV-B radiation they will try to establish a mechanistic link that will allow past UV irradiances to be revealed in cores of fossilised pollen. In this perspective piece we formulate a model for how this approach might be put into practice. How can we compare solar spectra with each other? Assessing differences in spectral irradiance is at the heart of our research group’s work, and yet considering entire spectra at once is not something that is straight-forward to do. Traditionally, most research has broken-down spectra into their component regions in order to compare one light environment with another, but looking at the whole spectrum has the potential to yield much more detailed information. Our open-access paper just out in Ecology & Evolution considers ways to quantitatively assess differences between entire solar spectrum. This approach is illustrated by tracking changes in the forest canopy through the spring and amongst stands dominated by different tree species. The method we used, called thick pen transform, involves redrawing our spectra of interest with increasingly thick lines and then comparing their similarity. This allows the coarse and fine features of spectra to be compared, and a “Thick Pen Measure of Association” to be calculated to quantify their similarity, as illustrated above. 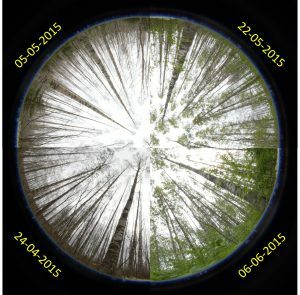 Using this technique, we were able to trace differences in the spectral irradiance at ground level between forest stands of birch, oak, and spruce at Lammi Biological Station in central Finland. 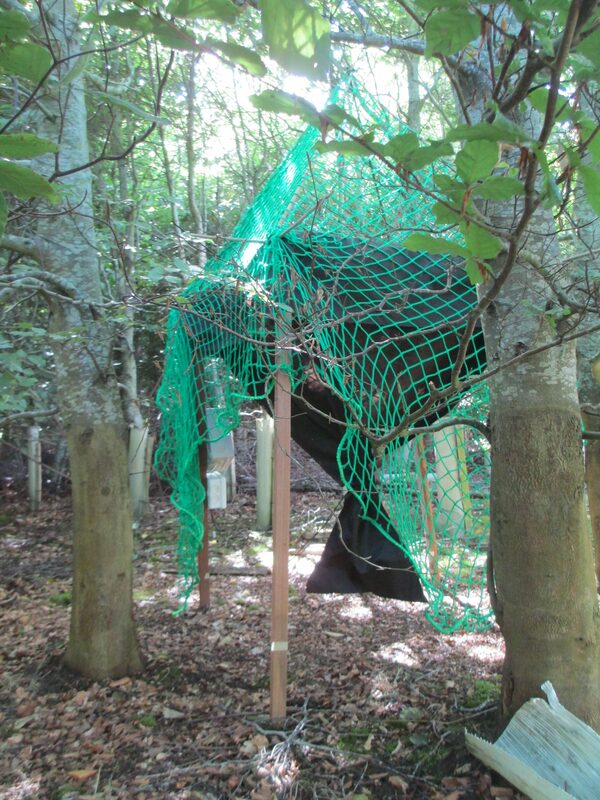 This is the first time such fine-scale differences in the light environment due to the species, phenology, height and leaf-optical properties of canopies have been distinguished. By better understanding how light environments in forests differ we can start to better explain the factors that control species composition and ecosystem functioning in these environments. As well as detailing the theory and methodology behind this research, the paper gives a comprehensive protocol of how to maximise the information obtained from hemispherical photos of the forest canopy. These are used to assess leaf area index and the sunlight reaching the floor throughout the year. Last Tuesday I presented the results of our Key Funding Academy of Finland Project to enhance the practical application of our research at an event for policy makers and civil servants at Finlandia Hall, Helsinki. Our project helps farmers and growers in the horticultural industry better manage the light that plants receive in greenhouses and polytunnels through selecting appropriate material for windows, nets and screens. It was one of just nine projects selected for poster-pitch presentation at this event which marks the culmination of this initiative. All nine are available to watch on the Academy of Finland’s website. In Arctic and alpine environments warming temperatures are expected to result in longer growing seasons and to encourage growth, but snow will melt faster and more will fall as rain. This means that the protective winter blanket of snow cover may no longer be present to hide plants from the extremes of cold that periodically occur. Whether plants can overcome this paradox to benefit from the increased sunlight and warmth above the snow, while resisting the greater fluctuations in temperature, will depend on their physiological capacity to cope with the changing conditions. 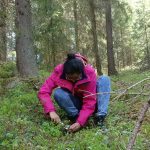 Is the paper, Solanki et al., 2018, published in a special issue of Plant Physiology and Biochemistry on UV-cross protection, we explore the ecophysiological response of Vaccinium hummocks to snow cover over the course of a year in central Finland. We focus on the role played by UV-absorbing compounds in protection against high light and low temperature combinations as shoots emerge from under snow in the early spring. The range of Holm oak (Quercus ilex), green; cork oak (Q. suber), purple; and their overlap, brown. Circle sample site, and triangle the field experiment. Complex trade-offs in allocation to growth can determine the success of oak species where their ranges overlap. This is highlighted by our paper Ramírez-Valiente et al., (2018), where higher root investment under seasonal drought by cork oak gave it an advantage over Holm oak, despite our prior expectations that the latter species is more drought tolerant. Following on from the publication of our database on the network of European beech trials in Scientific Data earlier this month, I spent last week with Marta Benito-Garzon & Santa Neimane in one UK trial testing a new approach to monitoring beechnut production. 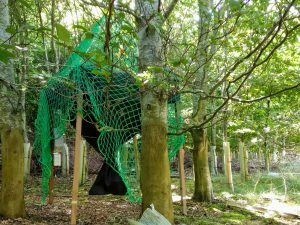 The prototypes will be deployed over this autumn and then optimized to register only falling seeds, not leaves or other objects, by validating the beechnut counts against the number of seeds caught in the bags beneath. 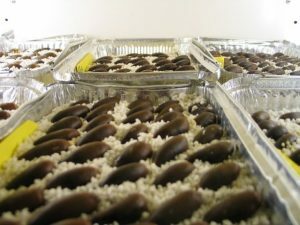 Once perfected the electronic monitoring system, designed by Marta Benito-Garzon (INRA Bordeaux) will allow researchers to follow the timing of autumn seed dispersal in real time from the comfort of their offices! How does plant photoprotection respond UV-A radiation? Short wavelengths within the UV-A region of the solar spectrum fall between the known action spectra of the UV-B photoreceptor, UVR8, and the photoreceptors CRYPTOCHROME and PHOTOTROPIN which are predominantly blue light and long-wave UV-A photoreceptors. 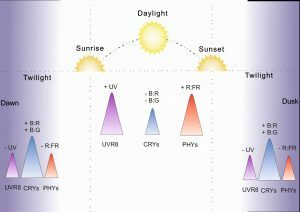 Our new paper, out in Physiologia Plantarum today questions the roles played by these photoreceptors in response to UV-A and whether radiation in the blue and UV-A regions can help prime plant photoprotection for subsequent high irradiance. 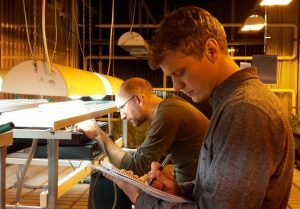 Craig Brelsford and Matt Robson take leaf chlorophyll fluorescence measurements under high irradiance. 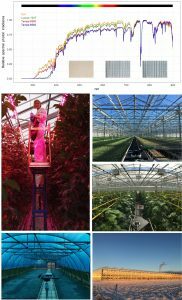 Do UV-A radiation and blue light during growth prime leaves to cope with acute high-light in photoreceptor mutants of Arabidopsis thaliana? 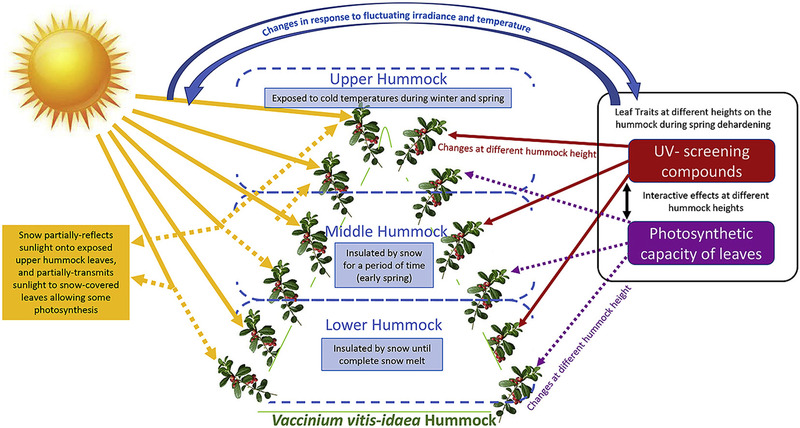 UV-screening and springtime recovery of photosynthetic capacity in leaves of Vaccinium vitis-idaea above and below the snow pack.